How much? | What Car? 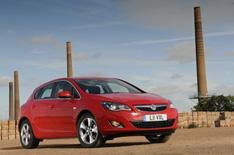 With a starting price of 15,675 for an entry-level 1.4-litre petrol model, the Astra's pricing structure more or less mirrors that of the Ford Focus. As is the case with the opposition, however, pressures to shift metal will mean canny buyers, and especially fleet managers, will pay nowhere near the list price. Running costs will also be extremely competitive. Insurance groups have been pared to the bone thanks to Vauxhall's boffins finding ever-cleverer ways of minimising the costs of repairing light crash damage. With heavier impacts in mind, all Astras come with the reassurance of a maximum five-star Euro NCAP crash test rating, six airbags, whiplash-minimising active head restraints and ISOFIX child seat fixings. Stability control is also standard throughout the range. There's a heavily revised engine line-up, too. Eight engines five petrols and three diesels will be available, all of which have reduced CO2 outputs and improved fuel economy over the old units.